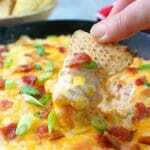 Jalapeno Popper Dip doesn’t get much better than this! 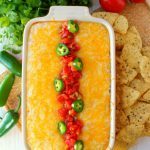 Made with Ro*Tel Original Diced Tomatoes and Green Chilies and Rosarita Traditional Refried Beans this hot cream cheese bean dip recipe is perfect for game day or anytime you want a delicious dip for snacking. We are a big-time football family! From early September all the way through the end of the season in February, there is pretty much always a college or pro game on at our house. It’s definitely one of our favorite times of year, and with that always comes great friends to watch the game with, and great food to celebrate a victory. 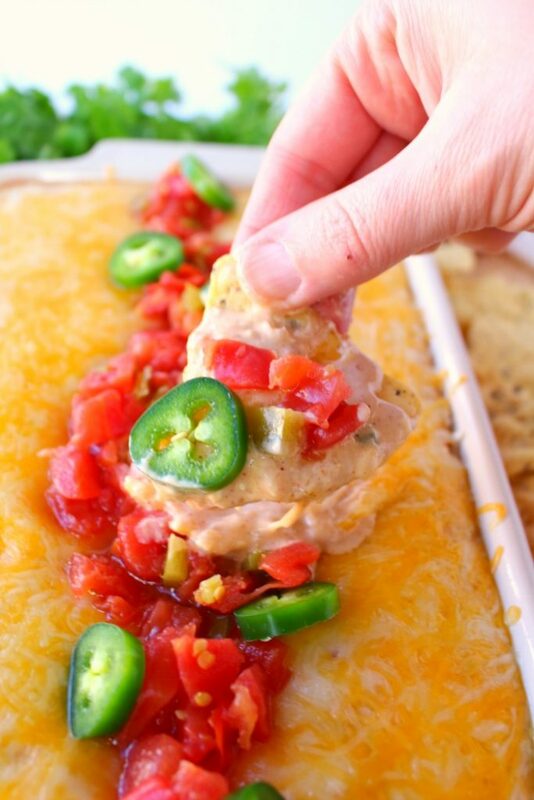 Tex-mex food is always popular at our house for game day, and a hot, creamy dip like this fabulous Cream Cheese Jalapeno Popper Bean Dip is definitely a must. 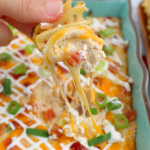 This dip the ultimate game day appetizer! The texture is wonderfully creamy and the melted cheese along with the Ro*Tel Original Diced Tomatoes and Green Chilies on top will keep you coming back for more. Keep plates and napkins handy, as this dip is quickly addictive! 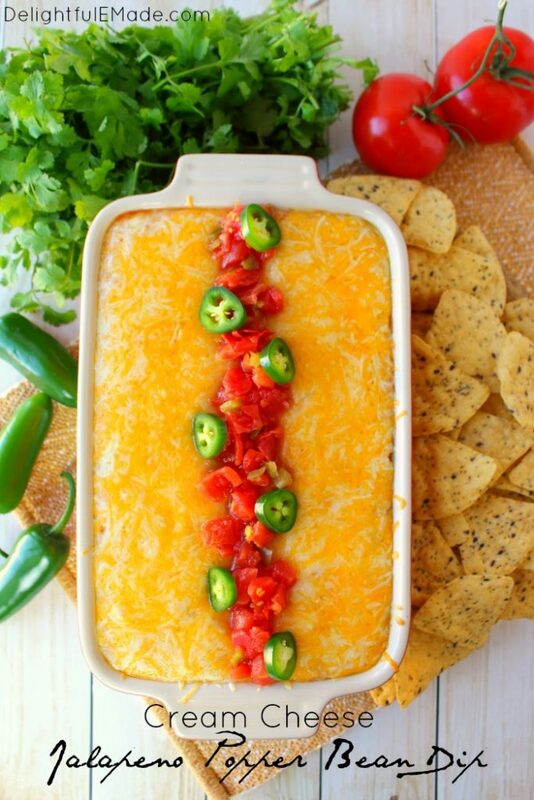 This hot dip is made with game day classics like Ro*Tel Original Diced Tomatoes and Green Chilies, which are the original Texas family recipe, and made with a signature blend of vine-ripened tomatoes and zesty green chilies and a savory mixture of secret spices. The recipe also calls for Rosarita Refried Beans, which are the original-recipe Mexican-style refried beans – authentic and delicious. Both of these become the creamy base of this dip, and along with cream cheese, shredded cheese and a few other ingredients, this easy jalapeno popper dip will quickly become an instant favorite with everyone at your party. 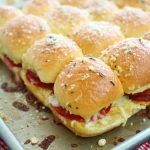 This easy appetizer takes just a few minutes to prep, but if you’re pressed for time before hosting your game day party, you can certainly prepare it ahead and refrigerate. Take the dip out just before your guests are set to arrive, and send it to the oven. By the time the game starts, you’ll have a hot, creamy dip fresh out of the oven, ready to feed your hungry fans. 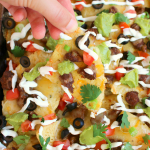 Make sure you get extra tortilla chips – this dip goes FAST! 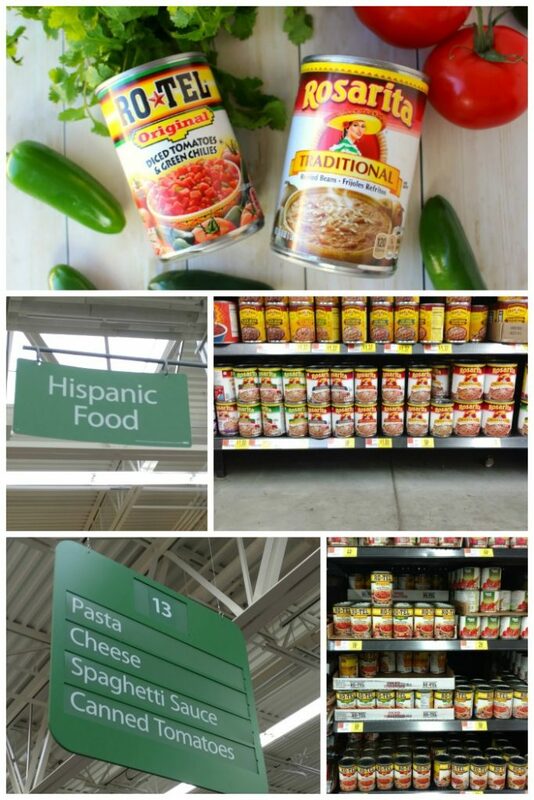 You can find both Ro*Tel Original Diced Tomatoes and Green Chilies and Rosarita Traditional Refried Beans at Walmart. Below, you’ll also find a Walmart quick shopping list for all of the ingredients you’ll need for this fantastic recipe! Paper plates and napkins, visit the Celebrate section where you can find fun football themed items. 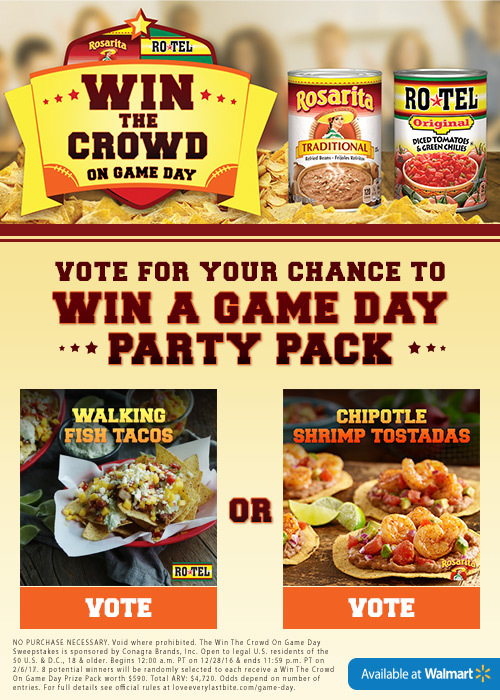 To make sure you’re ready for game day, head over to vote between these to amazing recipes. Once you vote you’ll be entered for your chance to win a Game Day Prize Pack including a flatscreen TV, a slow cooker, a $100 gift card for pro football gear, and a $50 Walmart gift card! 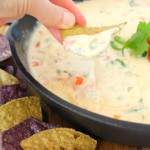 Jalapeno Popper Dip doesn't get much better than this! 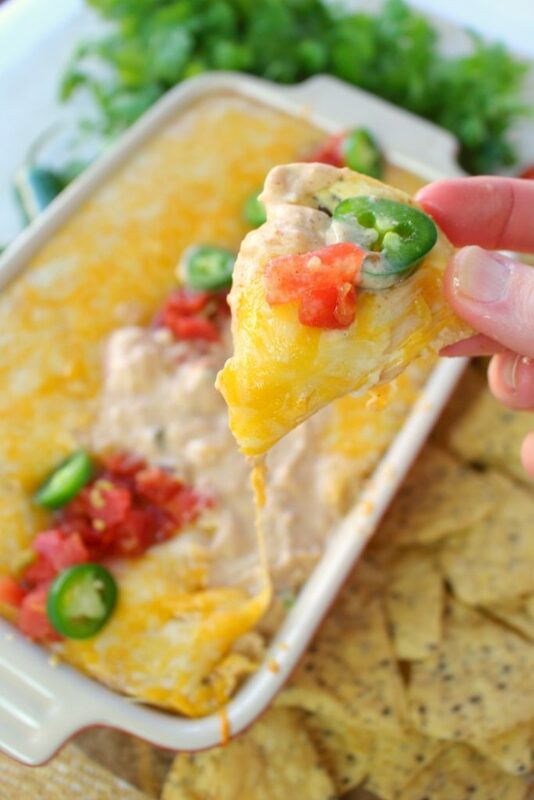 Made with Ro*Tel and Rosarita Refried Beans this hot cream cheese bean dip recipe is perfect for game day or anytime you want a delicious dip for snacking. Lightly spray a medium baking dish with non-stick cooking spray (dish shown is 7x10. 9x9 would also work well.) Set aside. In a mixing bowl, combine the Ro*Tel Original Diced Tomatoes and Green Chilies and the Rosarita Traditional Refried Beans. Add the sour cream and cream cheese and mix until smooth. Add the taco seasoning, diced jalapenos, and 1 cup of the shredded cheese, and stir until completely incorporated. Pour into prepared baking dish and spread evenly. 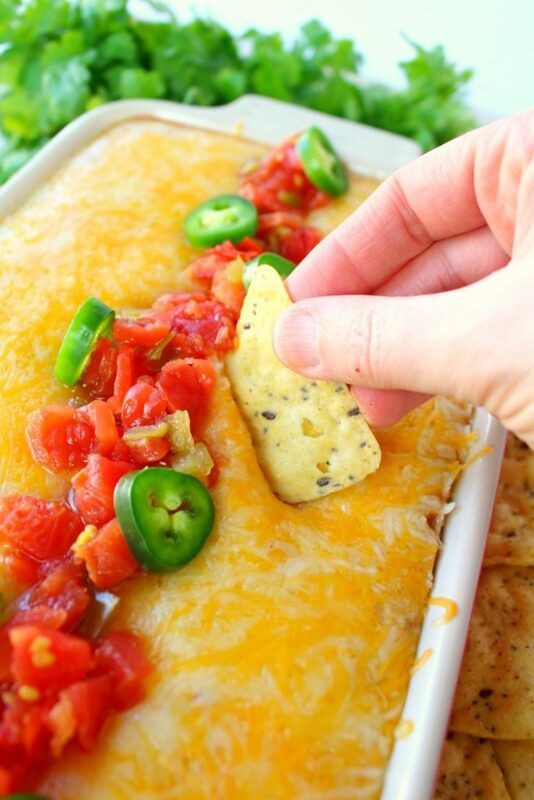 Top dip with the remaining shredded cheese and bake at 350 for 18-20 minutes or until cheese is completely melted. Serve hot with your favorite tortilla chips. Just looking at the pictures makes my mouth water. It's a beautiful dish! Thanks for sharing at the What's for Dinner link party. Yummy bean dip. Thanks for sharing at the Inspiration Spotlight party. Pinned & Shared. 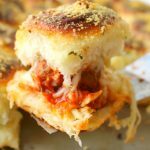 Any recipe that requires breaking through a thick layer of cheese is a recipe that I can certainly fall in love with! Thanks for sharing at #bloggerspotlight!! I am featuring you this week. It wasn't fair really, I am such a nut for jalepeno poppers and I LOVE dip..... no one else stood a chance!!! Loved this the first time you shared it and love it now too! Thanks for sharing at the What's for Dinner link up!